Dorothea Lange. Migratory Mexican field worker’s home on the edge of a frozen pea field, Imperial Valley, Imperial County, California, March 1937. On October 24, 1929, a chilly but sunny fall morning, the British Chancellor of the Exchequer, Winston Churchill, paid a visit to Wall Street. For several days, there had been widespread nervousness following extreme market fluctuations. That morning, business began calmly enough. Then, at around 11 a.m., a wave of panic selling broke. As the future prime minister of Great Britain recalled in his memoirs: “So there they were walking to and fro like a slow motion picture of a disturbed ant heap, offering enormous blocks of securities at a third of their old price and half of their present value, and for many minutes together finding no one strong enough to pick up the sure fortunes they were compelled to offer.” Trading was suspended several times that day and within the space of only two hours the slump in prices wiped out more than eleven billion dollars. The following day the effects of Black Thursday spread to Europe, where Black Friday marked the beginning of a chain of catastrophic developments which led to the collapse of the global economy. So began the Great Depression, a worldwide economic crisis which was only overcome in the United States when the nation entered World War II. The direct effects of the stock market crash were cataclysmic. After the market collapsed like a house of cards, panic overtook every sector. Banks no longer lent money, businesses were forced to close, unemployment rose to 25 percent, and by 1932 average earnings had more than halved. The rural population was particularly hard hit. Farmers were already in dire straits in the 1920s. 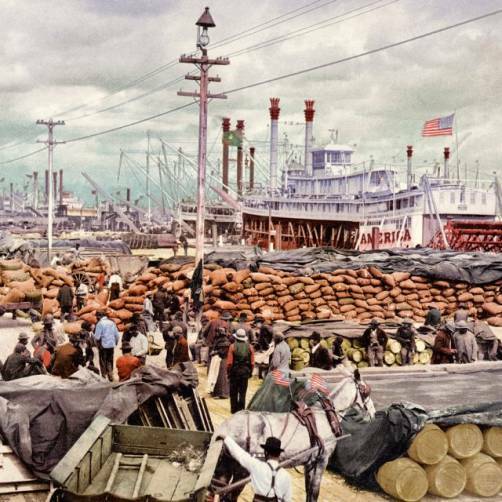 Heavy demand from war-ravaged Europe had fueled over-production, which in turn led to falling prices. Then, as Europe slowly recovered, sales to the Continent stalled. In the years that followed, one in four farmers was so deep in debt that he was forced to sell up. Natural disasters caused yet more problems. In order to create more land for cultivation, large areas were cleared of prairie grass, whose roots protected the upper layers of soil from eroding. In the 1930s, long spells of continuous heat and drought caused soil erosion across a vast area of the Great Plains, a wide belt of land extending down the middle of the continent from Canada to Texas. Here, in what became known as the Dust Bowl, the inhabitants were battered so hard by sandstorms that they had no choice but to abandon their land and migrate, mostly to California. At the peak of the devastation, in 1936, more than two and a half million people left their homes. Agriculture became one of the key issues in domestic policy. Roosevelt’s New Deal was an attempt to counteract collective despondency while also creating a basis for reform. As well as implementing welfare and labor law reforms, the main focus was on developing programs to help povertystricken farmers who had once owned or rented land. In 1935, economist Rexford Tugwell encouraged Roosevelt to set up the Resettlement Administration, renamed the Farm Security Administration in 1937. Its task would be to organize the relocation of farmers from the Dust Bowl regions. A historical section was created to document the process with Roy Stryker from Columbia University at its head. Marion Post Wolcott. 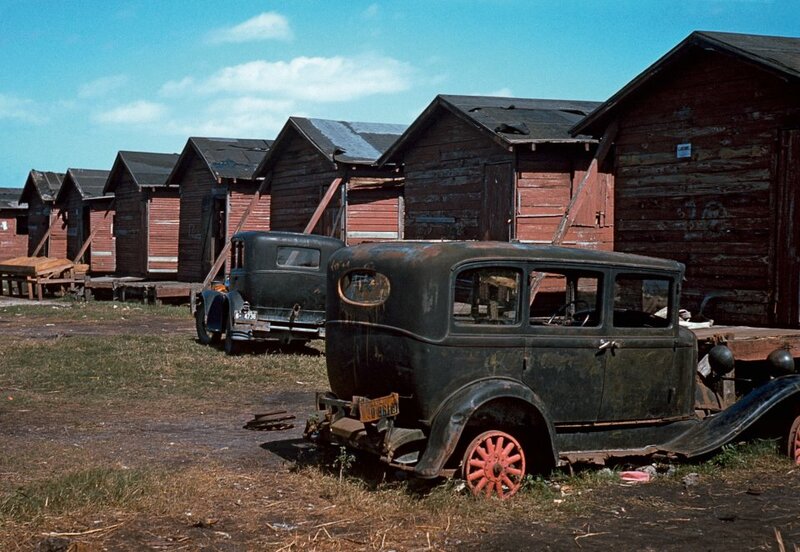 Shacks condemned by Board of Health, formerly occupied by migrant workers and pickers, Belle Glade, Florida, January 1941. Stryker’s objective was to create a picture of rural America on the threshold of the modern age to pass on to future generations. 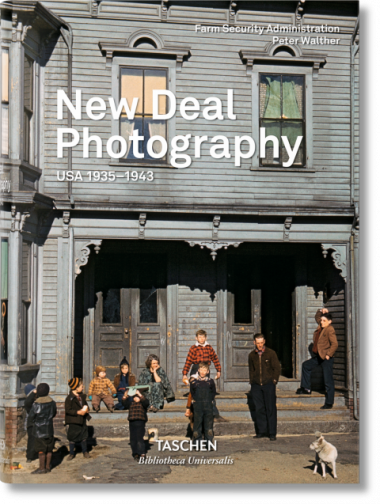 Although by calling he was an economist rather than a photographer, he had long been convinced of the value of photography as a means of illustrating economic issues. Instead of taking the view that “a picture says more than a thousand words,” he believed “the photograph is only the subsidiary, the little brother, of the word.” Stryker’s project grew into the 20th century’s most comprehensive collection of social documentary photographs. Between 1935 and 1943 more than 40 photographers took part in the FSA campaign. 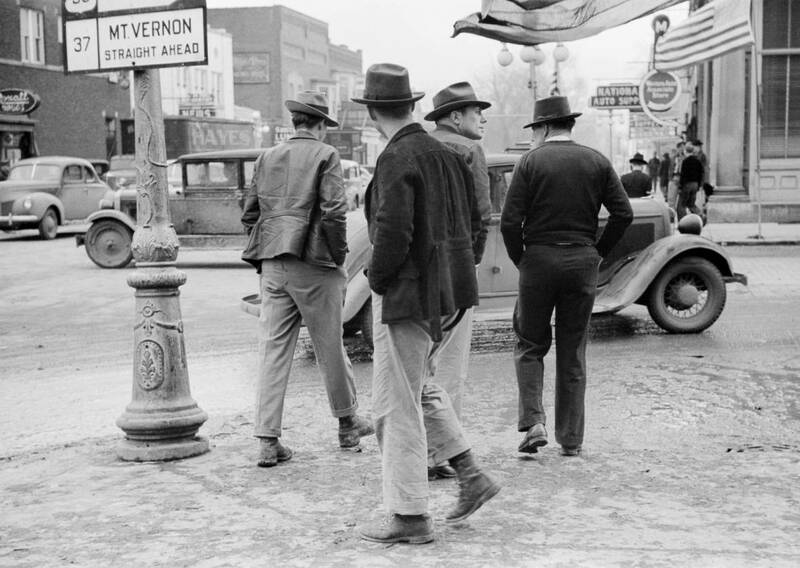 Arthur Rothstein, initially hired to set up the laboratory, Walker Evans, Theodor Jung, Dorothea Lange, Carl Mydans (who was replaced after a year by Russell Lee), and Ben Shahn were the first photographers Stryker engaged. Later they were joined by, among others, Jack Delano, Marion Post Wolcott, John Vachon, and Gordon Parks. Stryker’s choice did not follow any specific system. 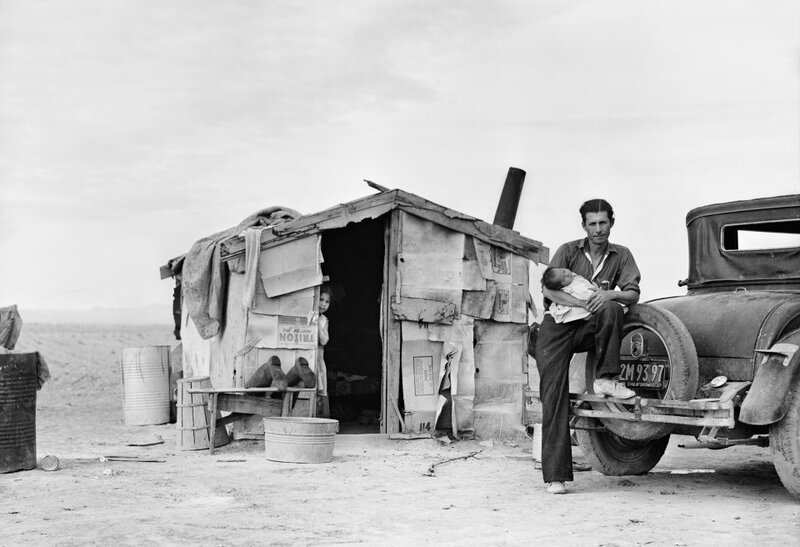 Some, like Walker Evans and Ben Shahn, had previously worked for the US administration; others, like Arthur Rothstein, Stryker knew from his time at Columbia, while he became aware of Dorothea Lange through her work in California. Stryker not only gave the photographers lessons and recommended reading; while they were traveling he sent them “shooting scripts” with quite concrete instructions as to what they should photograph. A script from Stryker for a photographer working in a small town might suggest specific focal points, such as a theater, stores, an autorepair shop, a hairdressing salon, the town hall, the prison, the firehouse, and perhaps hydrants or road signs. There could be instructions to highlight how people from different income groups spent their spare time. The photographers sent their film to Washington for processing in the section’s photo lab. In return, they received contact sheets with instructions to write captions for the shots Stryker had marked. By 1941, the FSA was under increasing pressure to justify its existence. Once the FSA merged with the Office of War Information, Stryker had little control over the choice of topics. He arranged for the Library of Congress to take over the collection. The move marked the end of the active phase of the FSA project and in the ensuing decades its photo-documentary works were widely forgotten. Only the iconic images created by FSA photographers survived in the visual memory of succeeding generations: Dorothea Lange’s Migrant Mother, Arthur Rothstein’s Dust Storm, Walker Evans’s New York photos and his shot of the Bethlehem graveyard, as well as Gordon Parks’s scenes from the life of Ella Watson, including his famous American Gothic. The 1962 MoMA exhibition curated by Edward Steichen paved the way for the rediscovery of the collection. 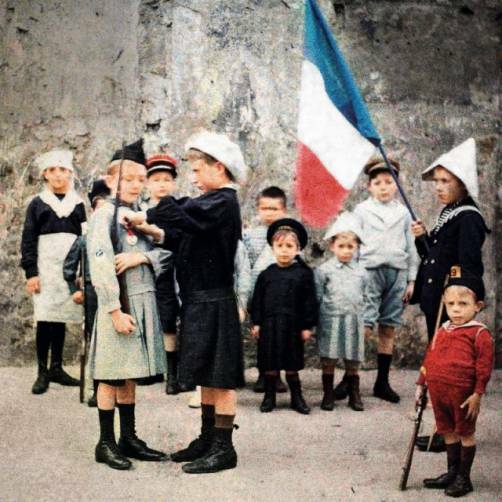 Since then, books containing FSA photos have appeared, mostly focusing on specific photographers, regions, or themes, but many pictures have remained unseen. Brought out of the archives, they bear witness not only to an unparalleled photo-documentary project, but also to a nation where, in an era of terrible hardship, people had courage enough to confront weaknesses head-on and find the strength to create a new beginning. Arthur Rothstein. Salem, Illinois, February 1940.